Affiliate Links: If you click on a link in this post, I may make a very small commission. Thanks so much for your feedback last month on this style of post. The consensus (and mine too!) was that the style was good, but the book reviews were cray. I was hoping to eliminate the book reviews and just share my favorites… and I kind of failed at that. The truth is, that while I love reading, I just don’t love writing reviews. SO, this month I’m going to try to do better and just share a handful of favorite books, what I bought, and my empties. If you want more information about what I’ve been reading, add me on Goodreads! I track and rate all the books I read over there. I’m really proud of myself this month. I went 3 weeks out of the month without buying a thing. Then I was invited to a pop-up shop for Emerald Cuff and purchased an adorable (and not yet available) striped cape. I also purchased the owl romper from the LC Lauren Conrad Runway Collection. (See my entire review of the collection here.) I told myself no new makeup this month, which I did successfully, and apparently I resisted the urge to buy all the clothes even though I ended up attending two fashion shows and had numerous other temptations. Now to be fair, some lovely companies did send me some great items as gifts, items for review, and gift cards to facilitate purchases which I’ve pictured above as well. Scarlet (Lunar Chronicles #2) by Marissa Meyer – ★★★★ – I’ll be honest – fantasy books are really not my favorite. Marissa Meyer’s Lunar Chronicles series are definitely different, entertaining, and always leave you ready for the next one. Finding Audrey by Sophie Kinsella – ★★★★ – Quite a different novel for Kinsella! There’s a romance, and there’s a lot of chatter between characters, but it’s different. Quieter, more serious in tone, and there’s mental illness covered which was very interesting. Overall, an enjoyable, serious yet sometimes lighthearted and humorous read. Going Off Script by Giuliana Rancic – ★★★★ – Okay, so truly I don’t recommend this if you don’t like Giuliana already, or her show Giuliana & Bill. (Which if we’re being honest, was probably one of my favorite celebrity reality tv shows. True story.) Her struggles with infertility and cancer were heartbreaking. A lot of her childhood and teenage anecdotes were funny if not a little side-eye inducing. Overall, a fun and easy read that I recommend. If you’re not a fan, take a pass, though. What have you been buying, reading, and using up this month? 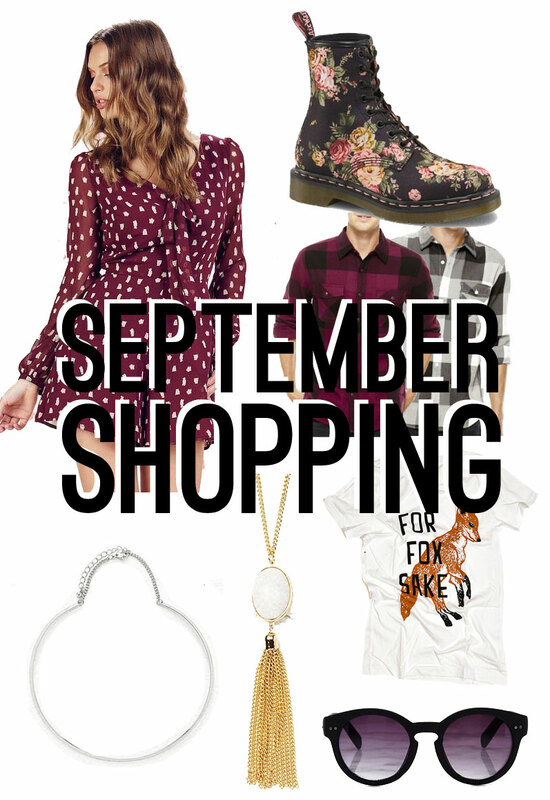 I’d love to hear about your September favorites (or flops) this month! I love the Lunar Chronicles so much, and I’m glad that you are enjoying the series, even if you don’t normally like fantasy. They really do have a way of drawing you in. And I’ll have to remember that the new Sophie Kinsella book isn’t her usual light hearted read when I pick it up. I’m gonna need that fox sake shirt! Awesome, so glad it was helpful Liv! My favorite find is my new Seahawks leggings from Bombsheller! Love supporting local businesses! That’s awesome, Portia! Sounds like a great find too! Love that Fox shirt and I love the Lunar Chronicles! They are such fun and different stories that are easy to breeze through! Thanks Chelsie! And yes, so true about the Lunar Chronicles! I just added you on Goodreads! I’m trying to read more, so I’m excited to see what books you liked.